RORY OCONNELL: Green and Black…..
What is green and black and hairy? No, not a ruck in last saturday nights match at Landsdown Road in Dublin, but in this case the almost rugby ball shaped fruit, known as the kiwi. Wasn’t the match terrific though, with our boys putting in a stirring if not a winning performance. What a sporting spectacle and in the unlikely event of Brian O Driscoll ever deciding to make the kitchen, rather that the rugby pitch his chosen place of work, well he certainly has the hands to wield a knife successfully. Glorious skills, but wow those kiwi guys know a thing or two about the odd shaped ball. Back to the reason for this post, the unfashionable and maligned kiwi fruit. 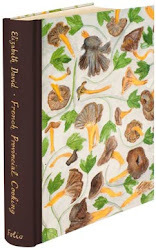 The little brown furry fellow, suffered enormously as a result of being a favourite garnish of chefs during the nouvelle cuisine movement in France and elsewhere during the 1980s. It ended up in a lot of inappropriate places, especially when combined with savoury dishes. Monkfish and kiwi was the inspired combination of one gastronaut during that rather misguided period. Eek! The bad taste associated with it still lingers, to the point where many chefs will not consider having it in their kitchens at all. This is a pity, because in the dessert kitchen, it really has a lot to offer. Tangy and flavoursome when ripe and firm, the fruit is truly delicious. Simply peeled, sliced and lightly sprinkled with sugar, it makes an instant and easy fruit salad. Peeled, coarsely crushed and folded through a little whipped cream, you have an almost instant fool. Coarsely crushed again, and lightened with sugar syrup and a splash of orange juice, it becomes a wonderful sauce for a hot orange soufflé or a lemon mousse. It pairs brilliantly with mango, banana, strawberry and passion fruit. It has the ideal amount of acidity and flavour to make a great sorbet. 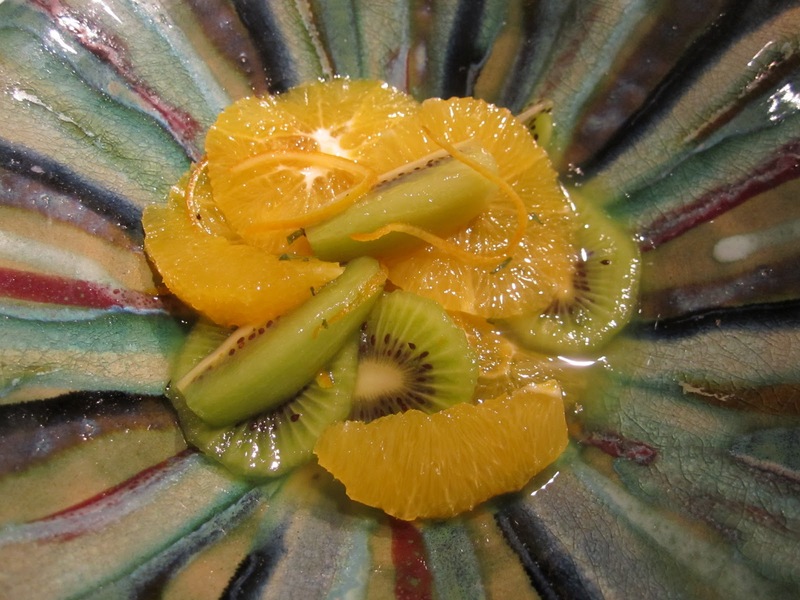 The recipe I am giving you here combines it with orange to make a light and refreshing salad. Eat this vitamin c packed dish on its own, with a yoghurt or caramel ice cream or just a drizzle of cream. A thin, light buttery biscuit would also be a fine accompaniment. With a sharp swivel top vegetable peeler, remove the zest from one of the oranges in long strips, working from the top of the orange to the bottom. Cut the strips into long and fine julienne strips. Place in a saucepan of cold water and bring to the boil. Remove the strips, refresh in cold water and repeat the process twice more. Place the three times blanched and refreshed julienne strips in a small saucepan with the syrup, and simmer gently for about 15 minutes, or until the julienne looks translucent. Drain the strips in a sieve. Allow the syrup to cool. Kiwi fruit, being careful to retain the round and barrel like shape of the fruit. 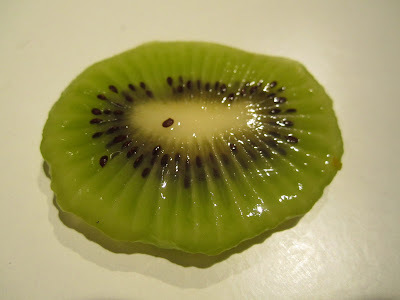 Slice the kiwi into neat slices or cut from top to bottom into wedges. I often mix slices and wedges to enliven the appearance of the salad. Add the kiwi to the oranges and pour over the cold syrup. Shake the bowl to encourage the ingredients to mix. Allow to macerate for 30 minutes. Sprinkle on the orange julienne just before serving.